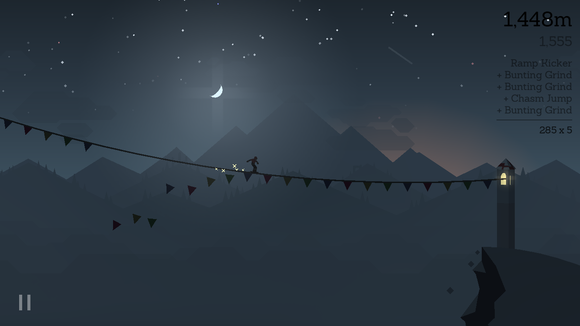 Trying to round up runaway llamas while evading crazed mountain elders sounds like a tremendously frantic and probably frustrating experience, yet playing Alto’s Adventure feels totally Zen. 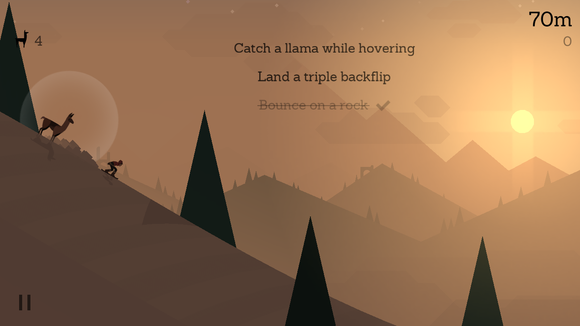 Alto’s Adventure is like a much more relaxing version of the Great Llama Chase of 2015. It hones in on a sense of serenity that the vast majority of endless runner-style games completely avoid, and when your time comes and you end up with a face full of powder (or worse, boulder), the conclusion doesn’t feel so devastating. Just get back on the board, man. There’s a gorgeous sunset on the horizon just begging to be the backdrop for your double backflips and gnarly grinds. Most of the credit for this unique tone goes to Alto’s Adventure’s visual design, which is nothing short of mesmerizing. It eschews realism in favor of building big personality via dazzling animations, a stunning day-night cycle (plus weather) that really changes the play experience, and wonderful little details—like tiny bunting flags falling off the wires you grind. Add in a rousing bit of music and the game makes a really strong presentational imprint. See the guy riding the llama on the left? He’s an angry mountain elder, and if you let him catch up to you, he’ll knock you down and end your run. Ready to hit the virtual slopes? 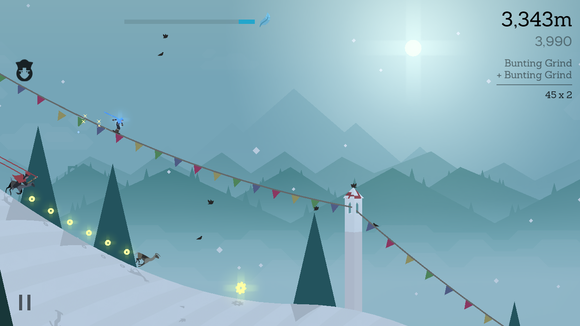 Here are three reasons why Alto’s Adventure is worthy of a visit before spring rolls around. It’s seriously stunning: I hate to dwell on graphics; many great games have adequate or even underwhelming visuals, and it doesn’t hurt them a bit. But sometimes a game’s aesthetic is its anchor: a style that informs the gameplay and drives the experience, and that’s definitely the case with Alto’s Adventure. Comparisons to Ridiculous Fishing aren’t off base: it similarly has flat environments with lots of sharp edges and stark colors, but there’s such a tranquil beauty here that comes off as totally fresh. You’ll need to time your leaps properly to get over a pair of nearby chasms. Grab the coins to spend on upgrades between runs! What makes a minimal art style really sing is the sense that every little detail has been fussed over, and Alto’s Adventure definitely succeeds in that respect. It’s in the way the foreground and background scroll slightly askew, creating the illusion of depth. It’s the way the little birds flit away as you approach, and how dramatically the lighting shifts as the sun rises and sets. For anyone who thinks “minimal” means lazy, just spend a few minutes in this inviting winter wonderland. Stay cool: To borrow a couple of snowboarding stereotypes, Alto’s Adventure is much more of a “chill brah” than an “extreme dude.” It doesn’t have an array of absurd tricks to pull off, nor does it ever devolve into in-your-face attitude. Instead, it has a very quiet and calm demeanor, delivering the sensation of a harmonious stroll on the slopes rather than a combo-crushing, antagonistic high score slog. Alto’s Adventure keeps things simple, with plain backflips and grind moves, and controls limited to tapping to jump and holding down a thumb to backflip. That’s it! That makes the game ultra-accessible to all comers, even if you didn’t grow up nailing trick strings in SSX or Tony Hawk’s Pro Skater. Shredding never has to end: the day/night cycle continues on, letting you ‘board in the evening. Avoiding hazards can be trickier in the moonlight, however. There’s (a little) more to it: I grew up on those comparatively complex console games, so it was initially difficult to resist the urge to want more in Alto’s Adventure. And if I had my way, admittedly I’d want just a little more variation in tricks. Heck, just adding a front flip would make a big difference. But while Alto’s simplicity could rub some the wrong way, it’s worth sticking around and digging deeper. 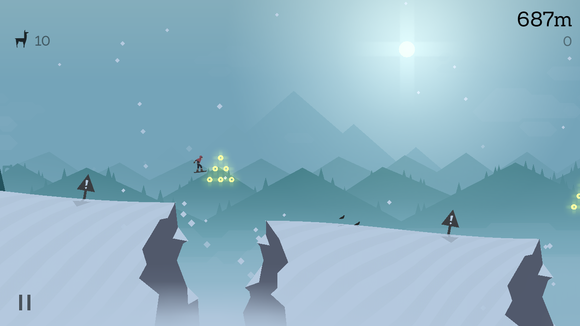 Each run begins with an overview of your current objectives, which give you new things to try on the slopes. Also, you’ll unlock different characters as you clear tasks and level up. You’ll always have up to three objectives to complete, and while the early ones are easy, the later tasks—a triple backflip, really?—require risking your run on a single move, which means really waiting for the perfect opportunity to pull it off. And if you save enough coins, you can unlock a wingsuit, which changes up the gameplay a bit. 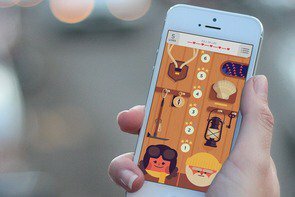 Without in-app purchases, you’ll have to earn that one with consistent play. Luckily, the course is always changing thanks to randomized terrain. 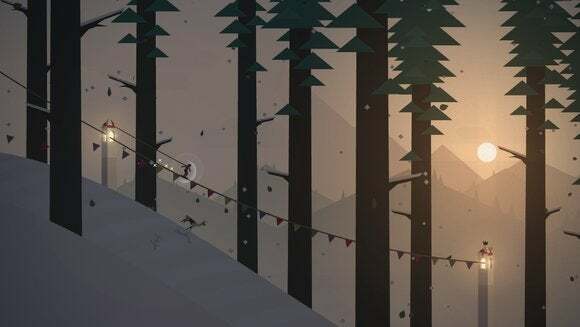 Alto’s Adventure might not have the gameplay depth of your average snowboarding game, but spend a few minutes soaking in these slopes and I think you’ll appreciate its low-key approach to a typically “extreme” sport.